The Ahmadiyya Muslim Community is pleased to announce that on 20 February 2016, theWorld Head of the Ahmadiyya Muslim Community, the Fifth Khalifa (Caliph), His Holiness, Hazrat Mirza Masroor Ahmad inaugurated the Baitul Ikram Mosque (The House of Honour) in Leicester, England. 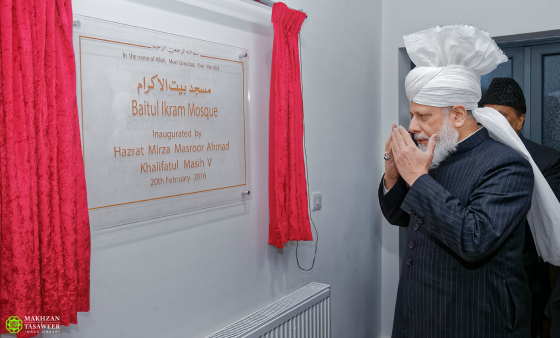 Upon arrival, His Holiness officially inaugurated the Mosque by unveiling a commemorative plaque and offering a silent prayer in thanks to God Almighty. 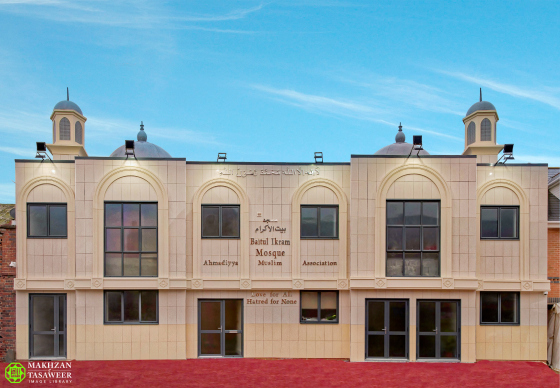 His Holiness then led theMaghreb and Isha prayers at the new Mosque, before meeting local Ahmadi Muslims.Later, a special reception, attended by more than 80 dignitaries and guests, was held to mark the opening of the Mosque. Various dignitaries and politicians, including Rt Hon, Keith Vaz MP and Simon Cole, Chief Constable of Leicestershire Police, attended. The highlight of the event was the keynote address delivered by Hazrat Mirza Masroor Ahmad during which he explained the true purposes of Mosques and highlighted the importance of fulfilling the rights of neighbours in light of the teachings of Islam.Speaking of the history of the city of Leicester, His Holiness commended the tolerance and integration of its citizens. His Holiness further said that the fact that Leicester is home to various religions and beliefs further enriches the city and “increases its beauty and attraction”.Elaborating upon the true purposes of Mosques, His Holiness said a Mosque is a place for Muslims to congregate in order to worship the One God and to fulfil the rights of God’s Creation. His Holiness said the Holy Prophet Muhammad (peace be upon him) taught his followers to like for others what they liked for themselves. The Khalifa explained that the definition of a neighbour as defined by the Holy Quran is extremely vast and requires a Muslim to treat all of mankind as his neighbour. In reference to chapter 22, verse 41 of the Holy Quran, His Holiness said that contrary to media’s portrayal, Islam sought to protect the right of all religions. By virtue of the commandment of this verse, the early Muslims were permitted to fight defensive wars in order to protect all religions, rather than just Islam. If the Muslims did not fight back, then no church, synagogue, temple, mosque or place of worship would remain safe. “It is the duty of Muslims to live peacefully alongside others and rather than oppose other religions or to harm their places of worship, it is the duty of Muslims to protect them.” His Holiness said in light of the true teachings of Islam the actions of those so-called Muslims who perpetrate cruelties are therefore “indefensible and entirely unjustified”. The Khalifa said that the need for mankind to join together for peace is more critical now than ever before. “God Willing, this Mosque will come to be known as a beacon of light that illuminates its surroundings and will come to be known as a true symbol of peace in Leicester. May Allah enable the local Ahmadi Muslims to fulfill the true purposes for which this Mosque has been built. 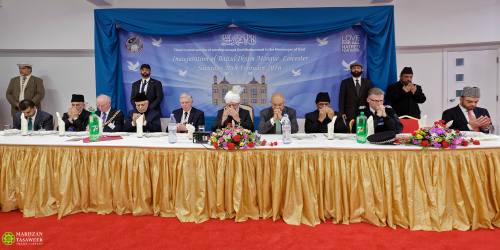 Ameen.”Earlier, various guest speakers also took to the stage in order to congratulate the Ahmadiyya Muslim Community on the opening of the Baitul Ikram Mosque. Share the post "New Ahmadiyya Mosque opened in Leicester by Head of Ahmadiyya Muslim Community"